Walter Henry Brown was born in Yeovil in 1895, however his parents are not known. Certainly by the time of his death his only living relative was his aunt, Mrs Dora Mary Carter. Walter enlisted in the Somerset Light Infantry, probably as soon as he turned 18. His Service Number 9581 indicates that he enlisted in February 1913. Although we cannot be sure which battalion he served with, it was most likely the 1st Battalion which was in England between 1913 and 1914. The battalion, as part of the British Expeditionary Force, fought on the Western Front from August 1914 as part of 11th Brigade of the 4th Division. (The 2nd Battalion was in India during the same period and remained in the country until 1917). Walter, however was to transfer to the 7th (Service) Battalion of the Gloucestershire Regiment. His new Service Number 25864 indicating that he transferred during November or December 1915. It appears there was a group transfer of men from the Somersets to the Gloucesters as fellow Yeovilian Frederick Harrison also transferred at the same time, receiving the new Service Number 25867 - just three away from Walter's. The 7th Battalion had been fighting in Gallipoli but moved to Egypt in January 1916. The 7th Battalion landed at Basra (in what is now southern Iraq) on 4th March 1916, after leaving Gallipoli for Egypt in January. In April, 7th Battalion took part in the costly and doomed effort for the relief of the besieged garrison at Kut al Amara, where Major-General Townshend's Division was encircled by a Turkish besieging army. One officer of the 7th wrote home to his sister on 24 April 1916, describing the Battalion's attack at Kut on the 21st ".... I never saw such a bombardment, it looked as if no Turk could live in such a hail of shot and shell - they did though, and when the time came for our fellows (the Worcesters) to advance, they were met with a terrific machine gun fire, which not only prevented out men getting forward, but decimated C. Coy. of the Glosters who were coming up to reinforce the Worcester firing line." The war against the Turks was matched by the war against disease. Smallpox, typhus and malaria were in constant attendance of the army, despite the efforts of the men and medical staff to keep them at bay. Walter Brown died on 10 August 1916 while on active service in Mesopotamia. He was aged 21. Walter is commemorated on the Basra Memorial, Iraq. His name was added to the War Memorial in the Borough in 2018. 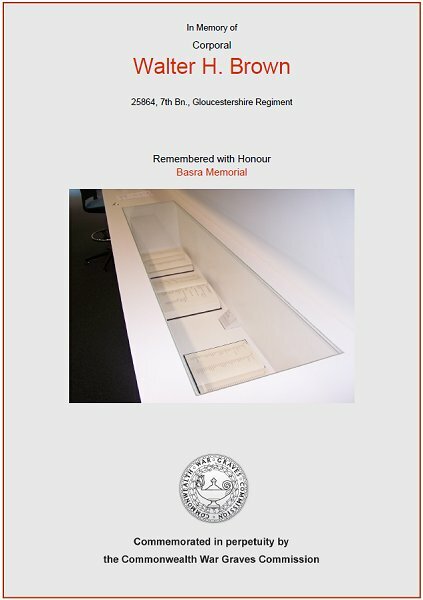 The Commonwealth War Graves Commission certificate in memory of Walter Brown.